What causes dry and sensitive skin? According to Kao Japan dermatology research, dry and sensitive skin is caused by a lack of Ceramide. Sensitive skin also caused by pro-longed exposure to UV rays and bad weather conditions such as pollution or even the use of unsuitable skincare products. When skin is lack of sufficient Ceramide it will result in skin problems and discomfort such as roughness, dryness, irritation, itching and redness, it is important to provide our skin moisturizing skin care which protects and replenishes the function of Ceramide. Kao Malaysia has brought in Curél, Japan's No.1 Skincare Brand for Sensitive Asian Skin to Malaysians by providing a holistic range of products that combat sensitive problem from its root. Here is my Curél Intesive Moisture Care Trial Kit III (Enrich) and Moisture Lip Care Cream (Light Pink). 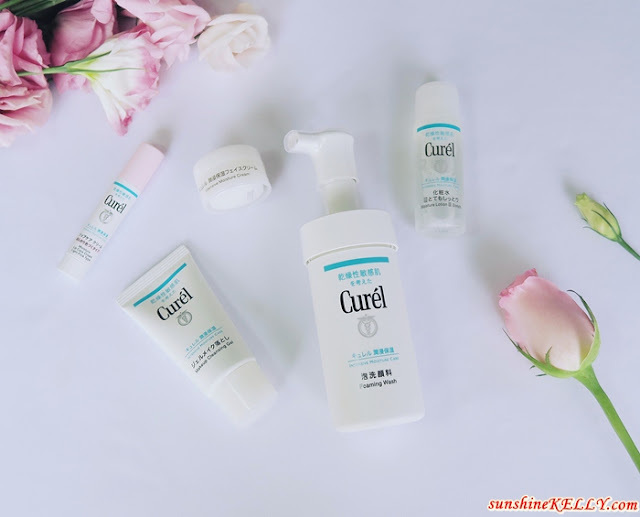 Basically Curél Trial Kit III consist of 4 products such as Foaming Wash, Makeup Cleansing Gel, Moisture Lotion III Enrich and Intensive Moisture Cream. Curél contains the essential ingredients to combat dry and sensitive skin such as unique Ceramide-functioning ingredient; a unique dermatological formulation and clinically proven to be hydrating, penetrating and moisture retaining for skin from within. Curél is the solution to relieve irritation and helps hydrate skin while providing highly effective solutions to restore the structure of the skin. Curél Makeup Cleansing Gel is perfect for travelling not only it thoroughly removes makeup including long lasting foundation from deep within pores but also protecting skin ceramide and skin moisture. Squeeze and apply the cleansing gel on skin, the soft gel spreads easily without the need of excessive rubbing. Then gently massage the gel on to the makeup and it instantly dissolves the makeup. Use cotton pad to wipe it off and cleanse the face with Curél Foaming Wash. It removes all the makeup easily and leaves the skin feels comfortable. Curél Foaming Wash comes with a pump dispenser that dispenses soft foamy facial cleanser that works gently on the skin without rubbing. It helps to thoroughly cleanses perspiration and dirt while protecting ceramide and contains cleansing ingredients that minimize stress on skin. Usually I use 2 pumps each time for day and night, gently massage the foam on face and neck and rinse off with water. Skin feels refresh, clean and soft with no irritation, tingling sensation or drying effect on the skin. Curél Moisture Lotion III Enrich is catered for dry and sensitive skin type. It comes in a transparent liquid form without any scent and contains Eucalyptus extract that penetrates deeply into the stratum corneum so skin becomes smooth, fully moisturized and resistant to external irritation. Usually I will soak a cotton pad with the moisture lotion and apply by patting it on my face and neck after cleansing. I like how it makes my skin feel supple, soft and smooth. The Moisture Lotion helps to improve our skin's natural barrier function, and protect skin from dryness. 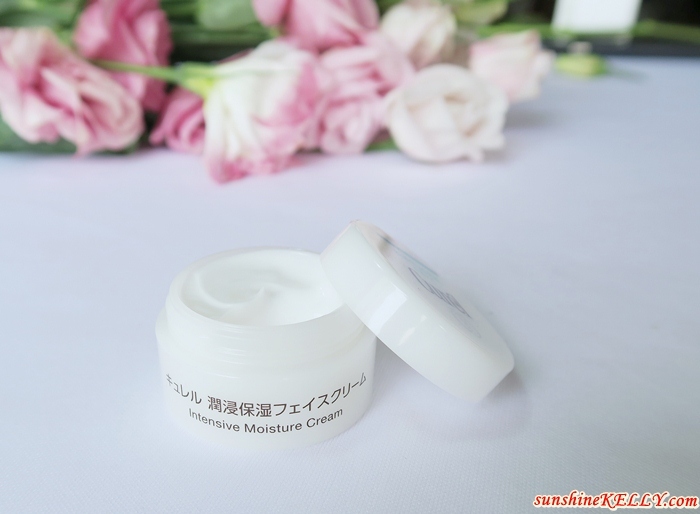 Curél Intensive Moisture Cream is one of my favourite and also Curél’s BEST SELLING product. The cream is very soft and it is easily absorbed by the skin, you will feel a velvety finishing, it’s not oily or sticky at all. The ceramide ingredients and Eucalyptus extract penetrate into our deep skin providing potent moisture and protection. My skin feels comfortably smooth and moisturized. Curél Intensive Moisture Cream is awarded Best Cream for 3 consecutive years by Japan's prestigious @ COSME Award. And also don’t forget about our lips too. Thanks to this affordable and effective Curél Moisture Lip Care Cream that helps to keep the lips moist and plump, say goodbye to dry, chapped and flaky lips. This is not any ordinary lip balm, the ceramide ingredients and formula locks moisture to prevent dryness and it adheres tightly on the lips. Love how it protects my lips and also gives it a light pink tint. My Verdict: Overall after using Curél Trail Kit III (Enrich) I can feel that my skin became more manageable, moist and no itchiness. 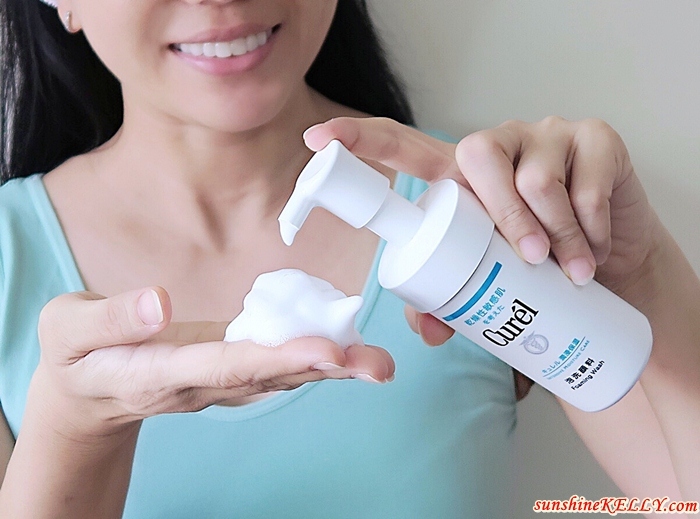 Sometimes when I stayed in air-condition room for too long my skin will start to itch, but after using Curél trail kit, I don’t face this problem anymore. For those of you who have dry and sensitive skin Curél Trial Kit III (Enrich) is your solution. This trial kit is perfect for my travelling too, not only they have the skincare essentials that I need but also the sizes are just right. Another reason for you to try it because the price is affordable, its only RM52.89 for 4 items. 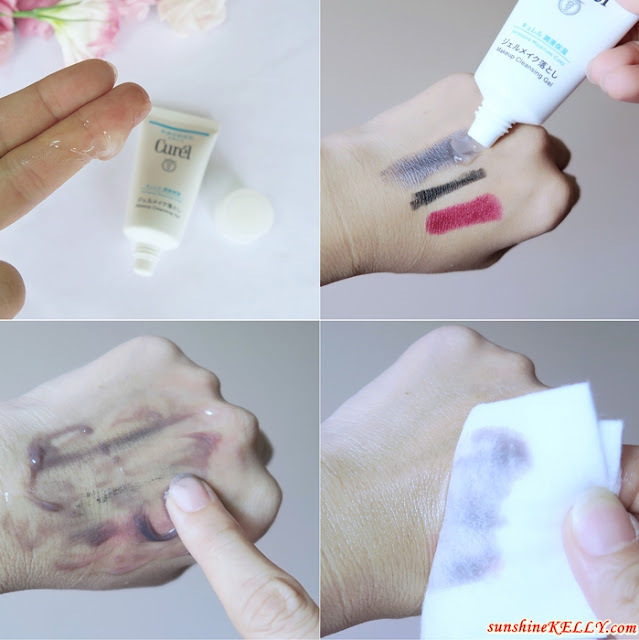 Curél Intensive Moisture Cream and the Moisture Lip Care Cream are my favorites. Availability: Curél is now available at selected Watsons Malaysia stores. The retail price of Curél products ranges from RM42.40 to RM111.30 inclusive of 6% GST. This is the first time I hear of Curél. I don't mind giving the trial kit a test run. Luckily it is easy to get from Watsons and not too expensive, too! Hi Emily, Curel just launched in Malaysia this month. Their best seller is the Intensive Moisture Cream. Ya, this is first time for me too. You look fresh. Will check out near Watson store in Section 9 Bandar Baru Bangi to give it a try. Thanks Nuha, yes this is a new skincare brand in Malaysia from Japan. Its now available in Watsons. Thanks Anuar, this product also suitable for men as well. I like how it removed al the makeup! I know you said its for sensitive skin but does that include eczema skin? Hi Rina, for eczema you got to be more careful, perhaps you can check with the doctor or skin specialist. I like how it effective clear off the makeup. I think I will a try on this brand. Hi Betty, the cleanser does not clear makeup, it only cleanse the impurities. You have to use the makeup cleanser to remove your makeup ya. Hi Sharon, go check it our at Watsons store. Hi Miera, yah i know that. Hope that you can check out this new brand in Watsons ya. I hope the product is gentle enough for even the most sensitive eye areas. Hi Nisa, this products are not suitable to be apply on the eye areas ya. I tried their testers before and like it because it's very lightweight and absorbs very fast! Hi Arisa, yes indeed! I love the texture and efficacy too. Thanks Aliza, i like the mild cleanser and also the intense moisturizer.